Let us remind ourselves the great sacrifice that has been made for us to be saved from the wages of sin which is death and the resurrection of Jesus Christ our savior which symbolizes love and hope to humanity. Happy Easter! FORMULA. All it took was one cross and 3 nails to be forgiven from our sins. God gave His beloved son Jesus Christ to die on the cross for us to be saved from our sins. 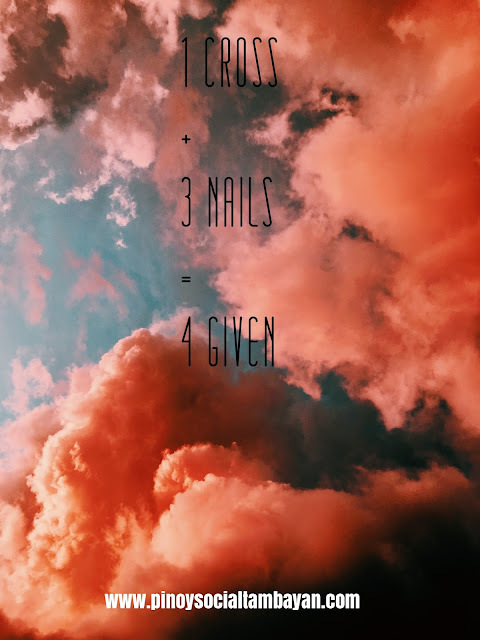 From then on, we were cleansed from our sins and was saved from eternal death. Thank you Oh Lord for the great love! GIFT. God has given us the gift of hope when He died and when He resurrected on Easter. His death and resurrection after three days is a symbol of hope and assurance. Despite of our sins, we still have a chance to turn away from our old worldly life and turn back to Jesus and live a Jesus-like life. In Him, there is an assurance that every pain is just temporary and joy is coming. Let us remind ourselves that we have this great gift. Happy Easter! TRUE MEANING. 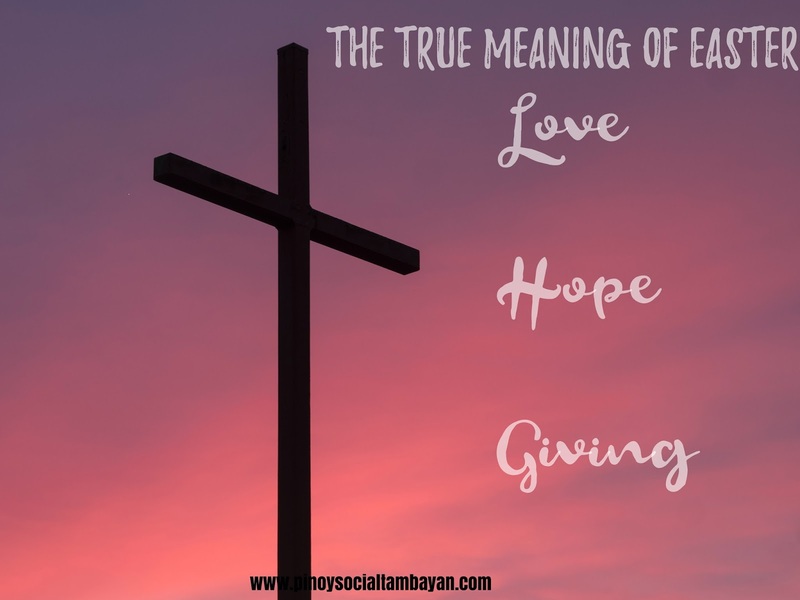 The true meaning of Easter is celebrating love, hope, and giving. Love, because it symbolizes the immeasurable love God has for all of us. Hope, because the death of Jesus Christ gave us hope because He saved us from our sins and then we could now have a great relationship with God. The gap that separated us from God has now a bridge which is His Son Jesus Christ; and Giving, because it symbolizes our thanksgiving to God. 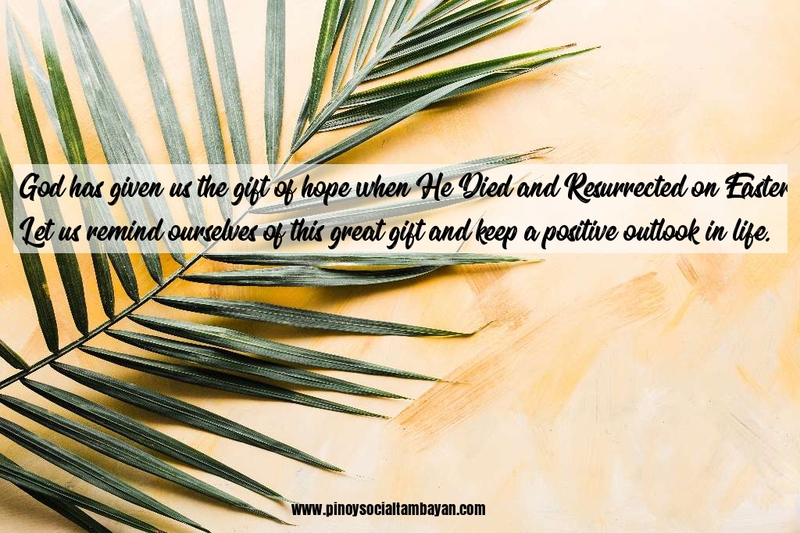 For more Inspirational Easter Messages, feel free to visit and follow our Official Facebook Page https://www.facebook.com/phquotestagalog/ and our Official Twitter Account @PinoyQuotes365 . For more Pinoy Quotes, Love Quotes, Jokes, and Hugot Lines visit us again here at https://www.pinoysocialtambayan.com/ and at our Facebook Page and Twitter Account.